Just for the record, Ninja S and myself still love NinjaCamp and everything it stands for. Unfortunately we both live regular non-ninja laden lives which require us to go into hiding outside of our annual KielbasaCon event. 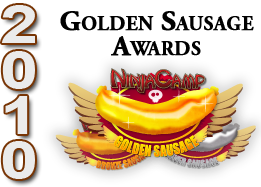 That said, someday, NinjaCamp will once again rise to greatness, and you will see more content with less legacy web design :). Thank you for visiting this site, and excuse how old most of these posts are.